It is my contention that when C.S. Lewis wrote his non-fiction book The Four Loves and published it in 1960, he had not been thinking about love in all of its manifestations for just a short time before it was written. All of the fictional works he wrote over the years, beginning in at least 1938, reflect his definitions and descriptions of the various kinds of love and their perversions that he systematically desctibes so well in The Four Loves. He does this in his fiction through his various characters and their actions. In Out of the Silent Planet (1938), Perelandra (1943), That Hideous Strength (1945), The Screwtape Letters (1942), The Great Divorce (1945), and Till We Have Faces (1956), Lewis demonstrates each kind of love he discusses in The Four Loves. For the 2014 Colloquium, I would like to focus on The Screwtape Letters in order to reveal the ways C.S. Lewis shows the reader the four kinds of love and their perversions instead of just refining and discussing the kinds of love as he does in The Four Loves. According to UNESCO's website, Index Translationum, C.S. 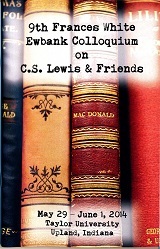 Lewis's The Lion, the Witch and the Wardrobe has been translated 127 times. The first person to translate the novel was Lisa Tetzner and it is this translation, which has run through the most editions. This paper proposes to look at that translation in terms of accuracy and to examine the changes that were made in terms of purpose. Were they caused by differences between the languages or were they motivated by other concerns? This paper will be an abridgment of a master's thesis written for the Children's Literature program at Hollins University. Susan Pevensie is one of the most misunderstood characters in C.S. Lewis' classic series, The Chronicles of Narnia. Writers such as Neil Gaiman, J.K. Rowling, and Philip Pullman have declared the character's face as a reflection of Lewis' sexism and misogyny, further claiming that Susan's exclusion from the final book of the series was due to her penchant for lipstick and nylons. Feminist criticism has found Susan's treatment pointedly gendered, displaying Lewis' supposedly negative attitude towards traditional forms of femininity. While "the problem of Susan" has garnered critical response, little thought has been given to Susan in relation to Orual, from Lewis' masterpiece Till We Have Faces. Orual is undoubtedly the most well-developed of Lewis' female characters, an ugly queen whose selfish love consumes everyone around her. At first glance, Orual and Susan seem polar opposites, yet a closer look reveals striking parallels between both characters' denial of divinity and espousal of the worldly. I propose that thoroughly examining Orual provides not only further illumination towards the character of Susan, but of her redemption. This paper will examine these parallels, Lewis' conception of these characters, and ultimately suggest an alternate motivation for the character of Susan.